﻿ Magnum Options Review - Is This Binary Options Broker a Scam or Legit? With respect to the bonus offered by Magnum Options, we rated it at a modest 70/100 as the bonuses offered were quite generous. As for their trading software, it earned a high score of 85/100 because of all the advanced tools and features which the platform has. For support customer, this scored a modest 65/100 due to the lack of telephone and multilingual support. Finally for the options choices, Magnum Options scored 90/100 due to the wide selection of option types that are available for trading. Operational since 2013, Magnum Options is a relatively well known binary options broker within the online binary trading community. Since its inception 4 years, this broker has grown by leaps and bounds ever since. Over the years it has built up a loyal following of loyal clients by providing them with personalized attention as well as servicing all their trading needs. With live news feeds, traders at Magnum Options will always be kept updated about current developments in the market. Regardless of one’s trading ability, every traders will no doubt enjoy a fulfilling trading experience with this broker though its intuitive trading platform and dedicated customer support team. The Magnum Options trademark is owned by a Bulgarian based holding company called Solaris Vision limited. The binary options trading platform was founded in 2010 but only became operational in 2013. The broker’s head office is located in Sofia, Mladost 4, BI. 428, Entrance 1, Floor 1/3, Bulgaria. The trading platform adopted by Magnum Options is the SpotOption 2nd generation platform. Because of its wide adoption by the majority of the binary brokers in the industry, some traders may prefer to deal with a broker that has a more refreshing platform rather than trade on a generic white labelled trading platform. Nevertheless, it cannot be denied that the SpotOption 2nd generation platform is one of the most popular binary options trading platform in the industry for the simple fact that it is packed with numerous advanced trading tools and features. The bulk of these features and tools are not even available on competing trading platforms. For example, Magnum Options’ trading platform comes with the special trading tool called the “Strategy Advisor”. With this tool, you can use popular technical indicators such as the Moving Average, Bollinger Band and RSI to help you analyze which direction prices will more within the near foreseeable future. 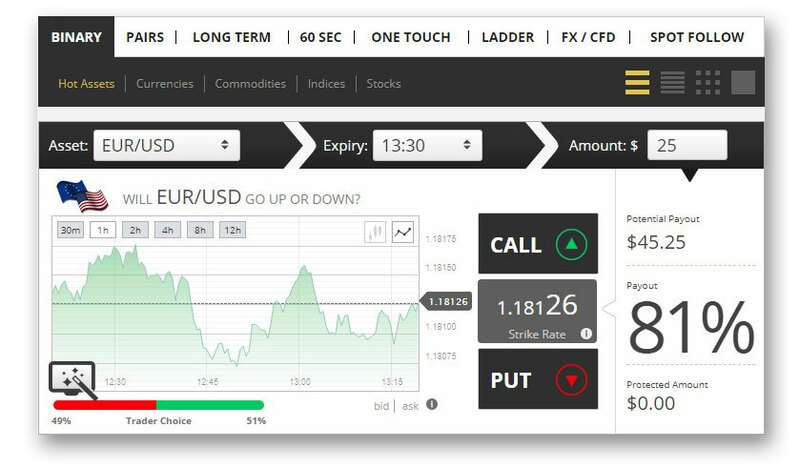 Another unique feature of the Magnum Options’ trading platform is the ability to implement a “Ladder” trading strategy using the ladder option trading mode. Although mobile trading apps are supported by SpotOption, Magnum Options currently does not have any separate mobile trading apps to cater to smartphones users. Nevertheless, the main web based trading is still easily accessible on the web browsers of any mobile devices regardless of their operating system. In terms of underlying assets that are available for trading at Magnum Options, they are classified into 5 different categories, forex, commodities, stocks, indices and pairs. Currently there are a total of 174 different types of assets, 9 types of commodities, 24 forex Pairs 24, 48 different Indices, 82 types of stocks and 11 paired assets. The following table below shows the full complement of underlying assets which you can trade with. Commodities: COFFEE, CORN, GOLD/EUR, GOLD, OIL, PLATINUM, SILVER, SUGAR, WHEAT. Forex Pairs: AUD/CHF, AUD/JPY, AUD/NZD, AUD/USD, BitCOIN/USD, CAD/JPY, EUR/GBP, EUR/JPY, EUR/SEK, EUR/USD, GBP/CHF, GBP/JPY, GBP/USD, NZD/JPY, NZD/USD, USD/BRLC, USD/CAD, USD/CHF, USD/JPY. USD/RUB, USD/SEK, USD/SGD, USD/TRY, USD/ZAR. Indices: ASX (AUSTRALIA), ASX FUTURE, BOMBAY SE, BOVESPA-F, CAC, CAC FUTURE, DAX (GERMANY), DAX FUTURE, DOW (US — DOW JONES INDUSTRIAL AVERAGE), DOW FUTURE, DUBAI (DUBAI FINANCIAL MARKET GENERAL INDEX), EGX 30 (EGYPT), FAZ-SHORT, FTSE 100 (U.K), FTSE FUTURE, HANG SENG (HONG KONG), HANG SENG FUTURE, IBEX, IBEX FUTURE, ISE 30 (ISTANBUL STOCK EXCHANGE), JAKARTA SE, KL FUTURE, KOSPI, KUWAIT (KUWAIT GENERAL INDEX), MICEX 10 (MOSCOW INTERBANK EXCHANGE), MSM 30 (OMAN), MSM 30 (OMAN), NASDAQ (US), NASDAQ FUTURE (US — NASDAQ 100 FUTURE), NIFTY, NIKKEI FUTURE, OMXC20, PSI20, QATAR (DSM20), RTS FUTURE, S&P 500 (US), S&P FUTURE, S&P FUTURE (US S&P 500 FUTURE), SHENZHEN300, SMI FUTURE, SSE180 (SHANGHAI STOCK EXCHANGE), STRAITS TIMES, TADWUL (SAUDI STOCK EXCHANGE), TEL AVIV 25, TNA-LONGX3, TSK60, TZA-SHORTX3, VIX. Stocks: (US THOMSON ), 3M, AIG, ALLIANZ SE, AMAZON, ANZ BANK, APPLE (US), AXIS BANK, BAE SYSTEMS (LONDON), BANCO SANTANDER, BARCLAYS, BHP BILLITON, BIDU, BLACKBERRY, BMW, BNP PARIBAS, BOEING, BP (BRITISH PETROLEUM), BRITISH TELECOM, CATERPILLAR, CITI (US — CITIGROUP), COCA COLA (US), DAIMLER AG, DANONE SA, DELL, DEUTSCHE BANK, DEUTSCHE TELCOM, DISNEY, EBAY, EXXON MOBIL, F5 NETWORKS, FACEBOOK, FIAT, FREEPORT McMoran, GAZPROM (RUSSIA), GENERAL MOTORS, GOLDMAN SACHS, GOOGLE (US), GROUPON, HSBC HOLDINGS (LONDON), IBM, JP MORGAN CHASE, LAS VEGAS SANDS, LINKEDIN, LOUIS VUITTON, LUKOIL (RUSSIA), MASTERCARD, MCDONALDS, MICROSOFT, NETFLIX, NIKE (US), NISSAN MOTORS, ORANGE S.A., PARIS TELECOM, PETROBRAS, PFIZER, PUBLICIS GROUPE, RENAULT, RIO T. VS. BHP B., RIO TINTO, RIO-AU, ROLLS ROYCE (LONDON), S BANK INDIA, SAB MILLER, SALESFORCE.COM, SBERBANK (RUSSIA). Pairs: AMAZON VS EBAY, AMAZON VS NETFLIX, BMW VS DAIMLER, BMW VS RENAULT, FACEBOOK VS TWITTER, FTSE F VS CAC F, GOLD VS OIL, GOOGLE VS BAIDU, LINKEDIN VS TWITTER, McDONALD’S VS STARBUCKSVODAFONE VS ORANGE. To cater to the demographic diversity of its client base, Magnum Options has provided 5 different types of trading accounts. The accounts are categorized according to their status as Beginner account, Semi Educational account, Full Educational account, Semi Advanced account and Full Advanced account. As for the funding of trading accounts, Magnum Options supports deposits by credit/debit cards, Neteller and Bank wire transfer. For withdrawals, traders may use their credit cards or go through a bank wire transfer. However, traders are only entitled to one free withdrawal per month and up to a maximum amount of $2000 per week. Subsequent withdrawals within the same calendar month are charged a $30 withdrawal fee. Withdrawal requests are processed once a week on every Thursday and takes up to 7 business days to be processed. The customer support service at Magnum Options is from 5am to 8pm (GMT) from Monday to Friday. Traders can contact the support team through email, live chat or by filling up the web contact form and requesting a call-back. In terms of educational resources, Magnum Options does provide their clients with a fairly comprehensive resource centre. Traders have access to various webinars and academy sessions and ebooks to help them enhance their trading knowledge. Although Magnum Options is not regulated by any binary options regulatory bodies, its existence since it began its operations in 2013, proves that they are a legitimate broker. With their return on investment as high as 81% and deposit bonus of up to 100%, it is of little wonder why this broker is able to draw a loyal following of clients. If you are looking for a binary broker that can offer you above average returns, then Magnum Options might just be the right broker for you. What Bonuses are available at Magnum Options? Magnum options currently a bonus called “Extra Trading Capital” for educational and advanced account holders. The bonus amount ranges from 50% to 100%. What are the payment methods supported by Magnum Options? For deposits, credit/debit cards, Neteller and bank wire transfer are supported. For withdrawals, traders can either withdraw through their credit cards or through bank wire transfer. What is the minimum deposit requirement at Magnum Options? The minimum deposit requirement at Magnum Options is $200 for the Beginner account. How long will it take to process a withdrawal request? Withdrawal requests at Magnum Options are processed once every Thursday. Each request takes up to 7 days to be fully processed. Is Magnum Options a safe broker to use? Yes, Magnum Options is a safe broker. Its 4 years operational history proves that it is not a scam broker.